You asked, we listened. Smashwords today added support for longer book descriptions. Our previous book description supported only 400 characters. Many authors found this limiting. We now offer an optional second, longer description that supports 4,000 characters. The longer descriptions are available immediately for all new book uploads. For our current 30,000 + titles (yeah! we surpassed 30K the other day! ), you can add the new descriptions by clicking to Dashboard: Settings. In the next few weeks, the longer descriptions will begin appearing at Smashwords retailers such as Apple, Barnes & Noble, Sony, Kobo and Diesel. If your book is already approved for the Smashwords Premium Catalog, your longer book description will trigger the "Resubmit this book for premium distribution" button. Click the button. This will put your description into our fast track queue for approval (see the approval requirements below). While the description sits in the queue, the previous version will continue to ship to retailers. Some of our retailers support both short descriptions and long descriptions in their feeds, so we'll provide both if available. After you upgrade your description with the addition of the longer version, we'll automatically ship the longer version to retailers that support it. As I write this, the feature has been live for only a few minutes and already I see Smashwords author DN Charles from Australia has become the first author to create a long description for their book, Child of the Moon. As with the previous descriptions, there are some basic dos and don'ts we and our retailers ask you to follow. DON'T WRITE THE DESCRIPTION IN ALL CAPS. AVOID ALL CAPS. Do make a good first impression. Write snappy, articulate copy that hooks the prospective reader from word one. I'm often surprised when I see authors write an uninspiring description such as "This is my poetry. I hope you like it." J.K. Rowling or Dan Brown could get away with that, but you can't. 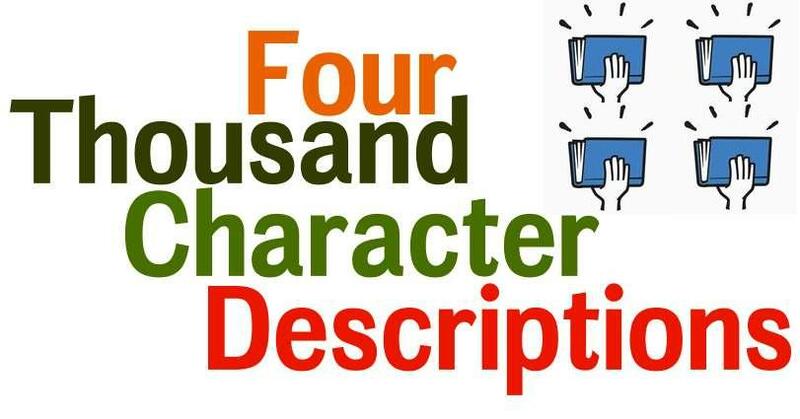 Take advantage of your description to celebrate your book. Sell! Do check your description for typos and grammatical errors (common sense). The longer descriptions are consistent with our ongoing effort at Smashwords to help our authors, publishers and retail partners improve the visibility and discoverability of Smashwords books. These improvements also improve discoverability of your books at Smashwords.com and in search engines. In the last few weeks, we've begun distributing author bios and other enhanced metadata to some of our retail partners. At Barnes & Noble, for example, we're now shipping author bios and double BISACs (BISAC codes are industry-standard category identifiers that help retailers place the book on the proper virtual shelf). More to come as we continue evolve our enhanced retailer metadata feeds.